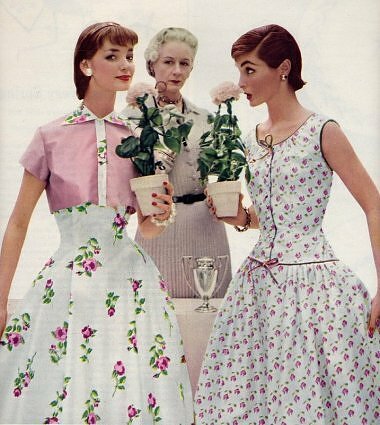 The Real Housewives of Jackson, Mississippi circa 1960. Keeping in mind how Kathryn Stockett wrapped up Jackson, Mississippi in the early to mid 60s in a pretty bow, I thought this picture was appropriate, especially since many of the scans I’m posting from actual citizens speaking their minds in Jackson are anything but. When Kathryn Stockett talks about her research she mentions the Clarion-Ledger, a paper now revealed as being pro-segregation. 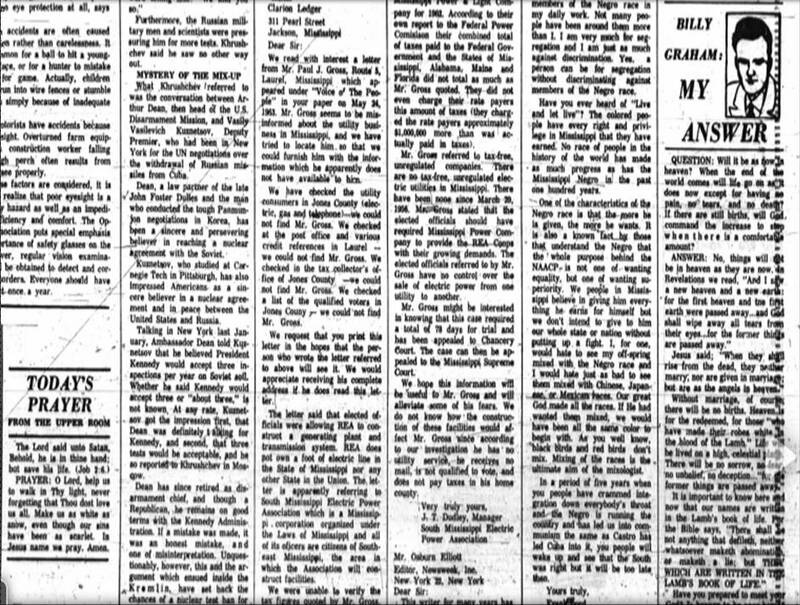 Here’s Stockett’s quote: I also read The Clarion-Ledger newspapers for facts and dates. Once I’d done my homework, I’d go talk to my Grandaddy Stockett, who, at ninety-eight, still has a remarkable memory. That’s where the real stories came from, like Cat-bite, who’s in the book, and the farmers who sold vegetables and cream from their carts everyday, walking through the Jackson neighborhoods. I found that people don’t seem to remember “social attitudes.” They remember what you could do, what you couldn’t do, and especially those people who went ahead and did both. Well, here are a few of the things I found about some, and I stress some of the good folks who ran Jackson. Funny how the articles in the Clarion just reek with “social attitudes” something Stockett either would not, or could not bear to deal with. Wait. . .diseases? 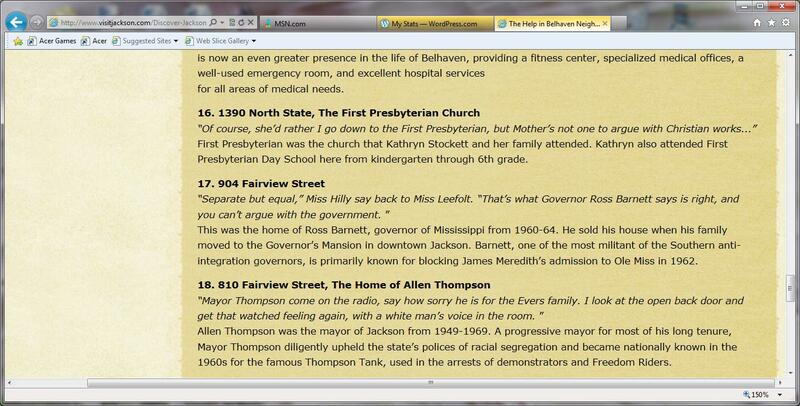 You mean there were more Hilly Holbrooks in Jackson, individuals who thought African Americans carried disease? How could this be? 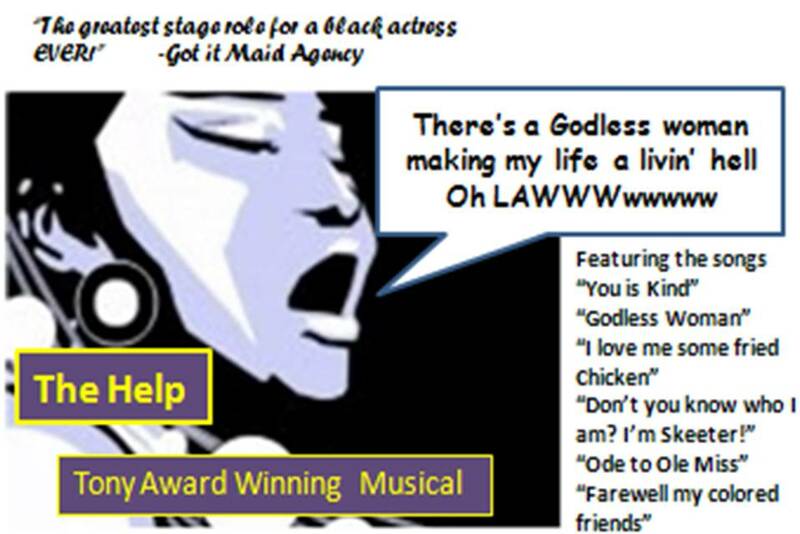 In The Help, only Hilly speaks of it and only Cocoa carries it (ironically Stockett creates a black character named Cocoa with a venereal disease, rubber stamping this misguided ideology). Apparently the sentiment was quite popular back in the day. Where’s all this “Affection” Stockett chose to focus on in the novel? So far its lacking. 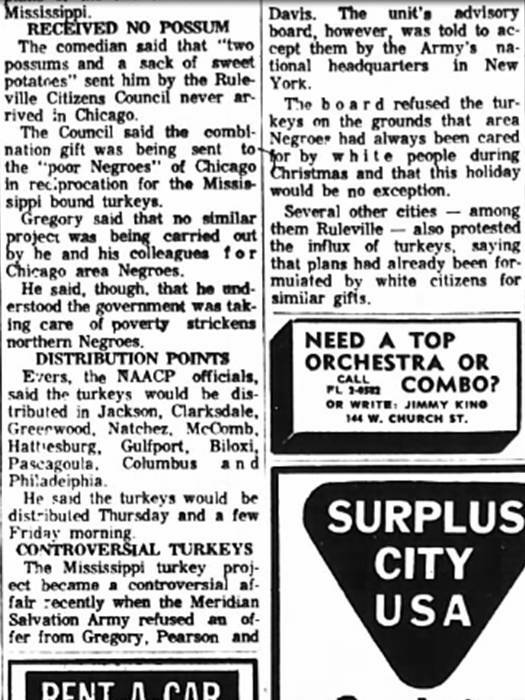 But I guess the real “turkey” is the reason that company president of the Robert E. Lee hotel gave for the place closing in 1964. The hotel is the same one Stockett mentions in her novel as the spot Skeeter and Stuart have a dinner date. The fight for freedom was opposed by extremists. This firebombing occured in Mc Comb, Mississippi and it’s just one example. 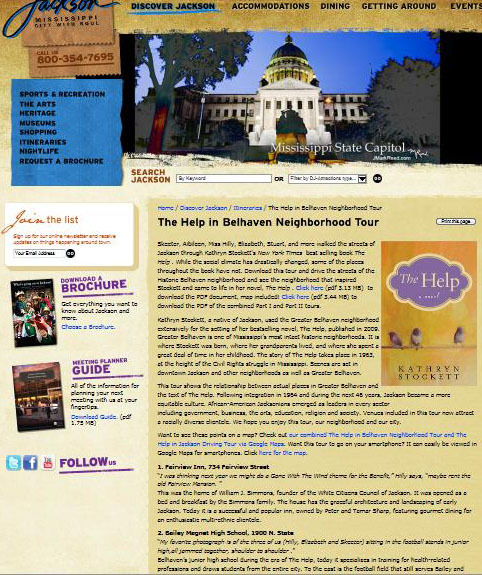 I want to show this interesting bit of marketing for Jackson, Mississippi that’s on the web, in hopes of capitalizing on the success of the novel. I’ve included screen shots from the site. This was the home of William J. Simmons, founder of the White Citizens Council of Jackson. It was opened as a bed and breakfast by the Simmons family. The house has the graceful architecture and landscaping of early Jackson. Today it is a successful and popular inn, owned by Peter and Tamar Sharp, featuring gourmet dining for an enthusiastic multi-ethnic clientele. Yes, because everyone knows no tour would be complete without visiting a segregationist’s former home. I’m not sure if the new owners would appreciate their inn being marketed this way, but I could be wrong. Allen Thompson was the mayor of Jackson from 1949-1969. 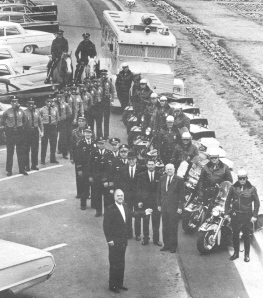 A progressive mayor for most of his long tenure, Mayor Thompson diligently upheld the state’s polices of racial segregation and became nationally known in the 1960s for the famous Thompson Tank, used in the arrests of demonstrators and Freedom Riders. Whoaaa! 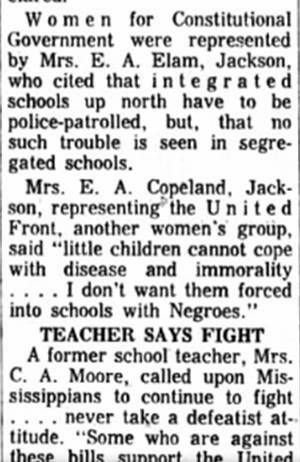 A “progressive” mayor who upheld the state’s policies of racial segregation. . .” did anyone proof read this before posting it on the internet? EPIC FAIL HERE. The “They” he’s talking about are the civil rights protestors. 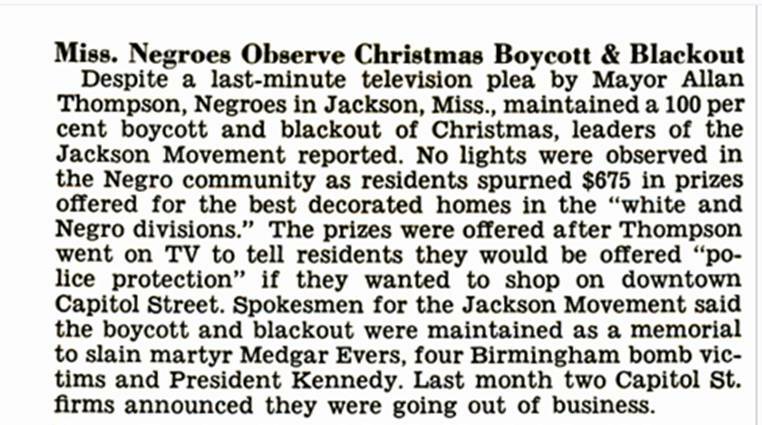 Thompson’s name comes up again when African Americans organized a boycott of Jackson Businesses during X-Mas in 1963. In fairness, most of the other tour “sites” don’t read as insensitive as the ones I’m using as examples. Still . . . Were most, if not all the real hoursewives married to men who practiced segregation unwillingly, the way Kathryn Stockett portrays it in her novel? And how about the news agencies? 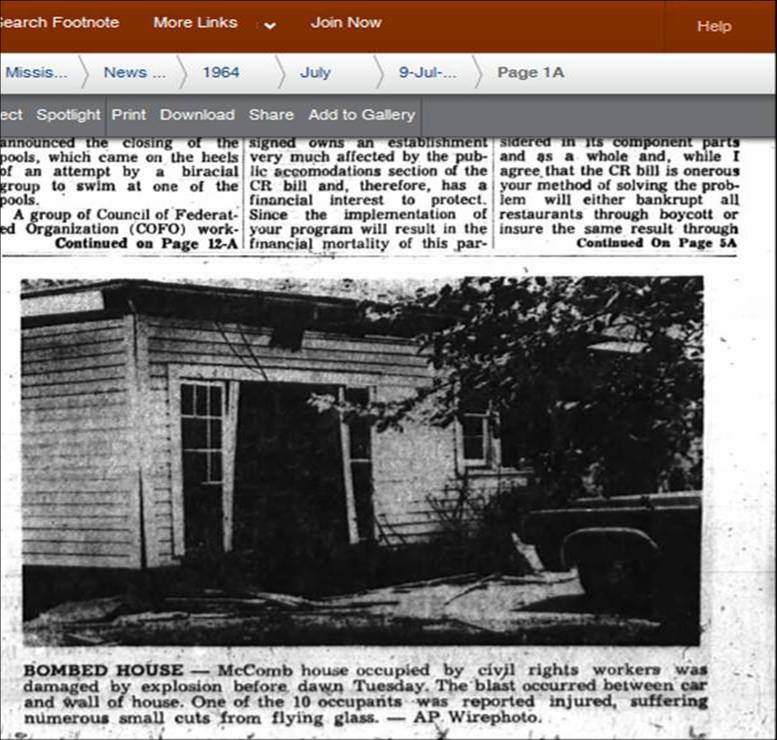 Since Stockett has her heroine, Eugenia “Skeeter” Phelan wanting to work in publishing, did Stockett even realize that Hazel Brannon Smith, a newspaper editor had a cross burned on her lawn because some viewed her as sympathetic to civil rights protestors? 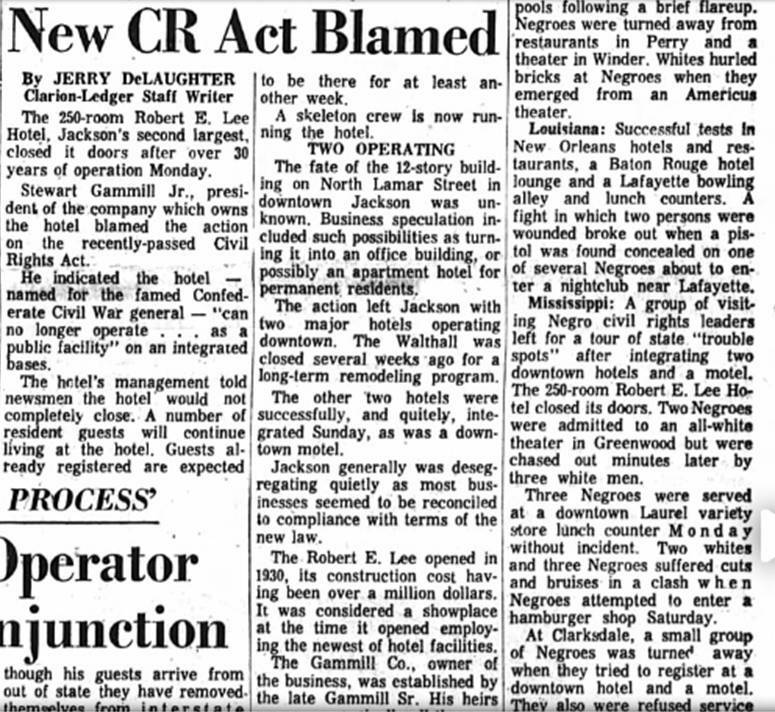 Did Stockett investigate just how forthright the Clarion-Ledger was back in the 1960s? Or did she only concern herself with housekeeping tips? In an era of darkness, The Clarion-Ledger and Jackson Daily News provided no light. 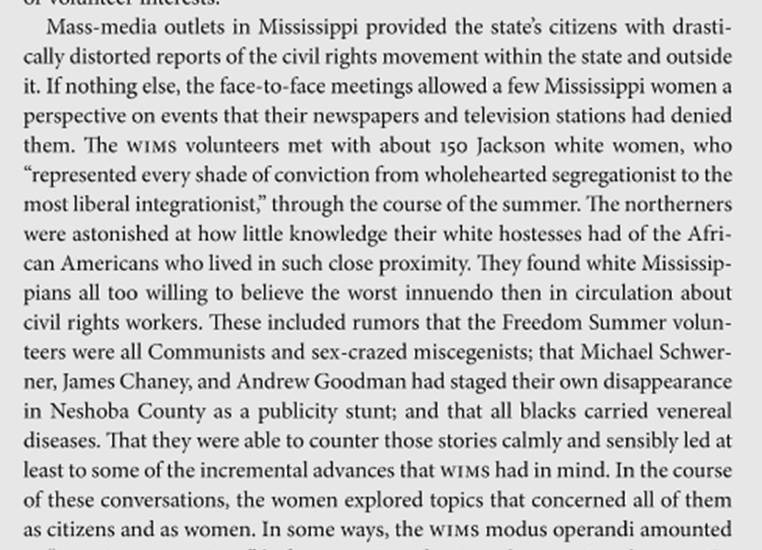 During the 1950s and 1960s, the sister newspapers regularly killed news stories and printed racist propaganda at the request of the state’s now-defunct segregationist spy agency, the Mississippi Sovereignty Commission. 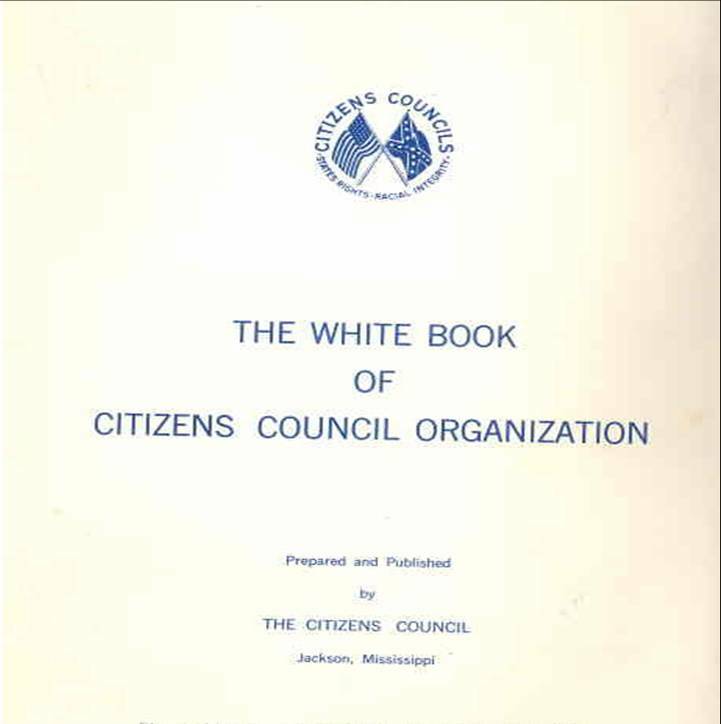 In addition to the Sovereignty Commission, there was a very active White Citizen’s Council in Jackson, Mississippi. Only I didn’t see it mentioned in The Help. Once the segregation battle was lost, the air went out of the White Citizens Councils. The councils steadily lost members throughout the 1970s and 1980s. Sensing the need for a new direction, Baum, formerly the CCA’s Midwest field director, called together a group of 30 white men, including former Georgia Gov. Lester Maddox and future Louisiana Congressman John Rarick, for a meeting in Atlanta in 1985. Together, they cooked up a successor organization: the Council of Conservative Citizens. ” . . . By 1956, the group claimed eighty thousand members in Mississippi. It was particularly active in the Delta region and also had a powerful Jackson chapter, led by William J. Simmons. 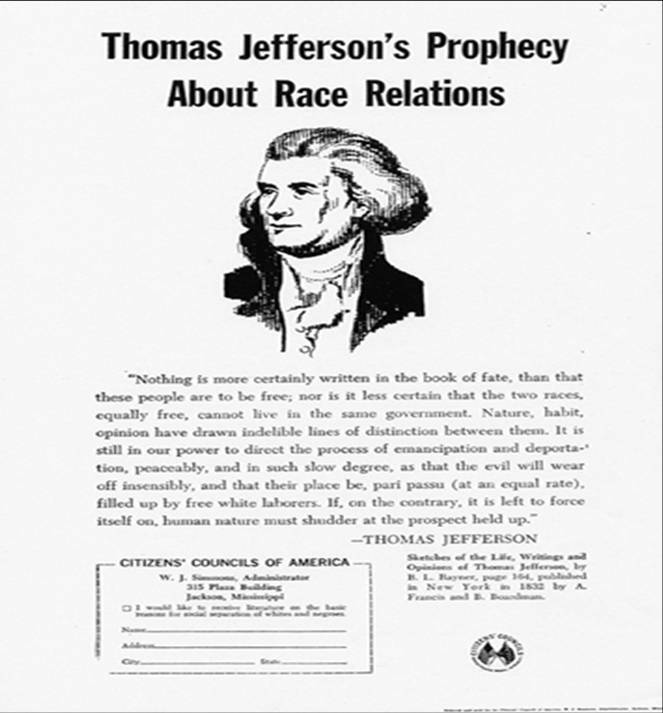 A national group, the Citizens’ Council of America, was formed by 1956. Its board of advisors included Senator James O. Eastland and Representative John Bell Williams of Mississippi, Senator J. Strom Thurmond and Representative L. Mendel Rivers of South Carolina, and Georgia Governor Marvin Griffin. The Citizens’ Council received its revenue from membership dues and grants from the publicly-funded Mississippi State Sovereignty Commission, an agency that promoted segregation and investigated the activities of civil rights groups. 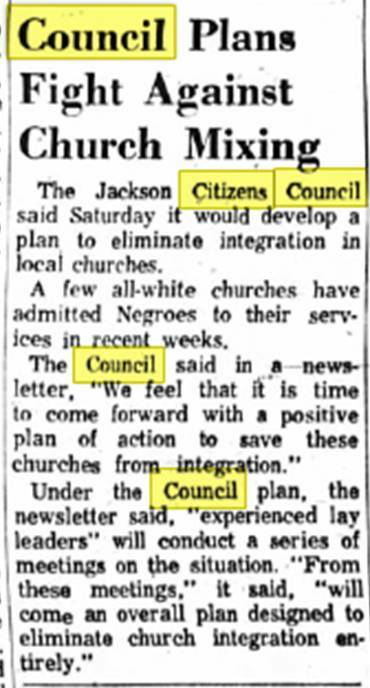 The Citizens’ Council officially eschewed violence as a strategy, although many Council members privately condoned the violent tactics used by the Ku Klux Klan. 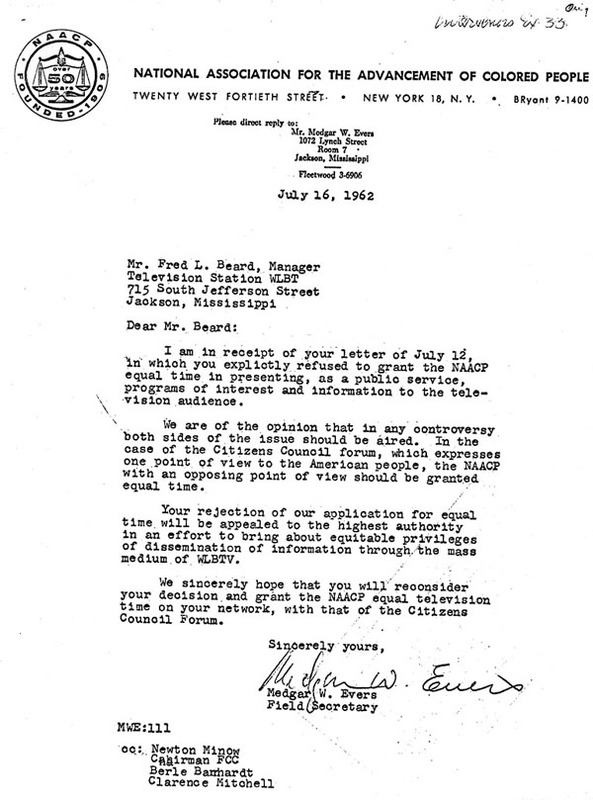 Council members used their connections to influential lawmakers, editors, business people, and state officials to enact pro-segregation legislation, exert economic pressure on those who supported civil rights activities, intimidate African Americans who attempted to register to vote, and create publicity for anti-integration viewpoints. The Council published a national magazine, The Citizen, and produced a weekly telecast, “Forum,” on WLBT-TV in Jackson. 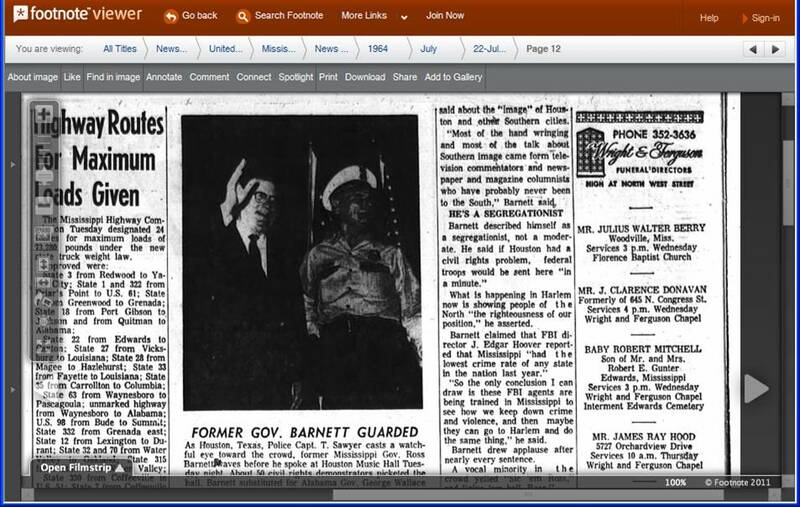 When Medgar Evers tried to win air time on WLBT in the 1950s and early 1960s, he had on his side the Fairness Doctrine. This FCC policy directed broadcasters to present programs on controversial public issues and enable those who disagreed to present their opinions on the air. Evers sent his complaints to the FCC, which took little action. 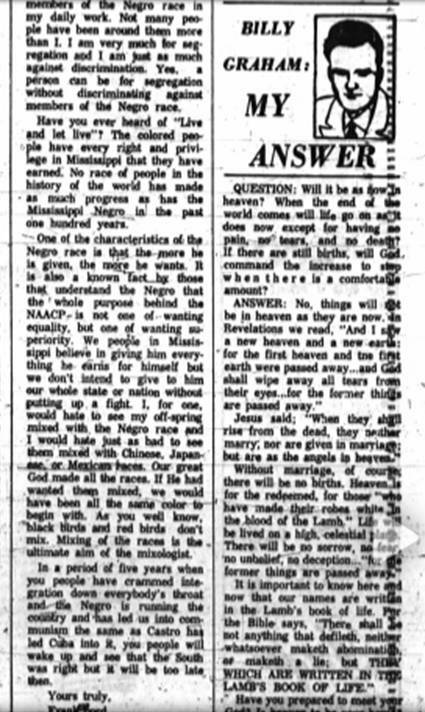 On May 20, 1963, Evers finally did appear on WLBT and responded eloquently to a broadcast by Jackson’s mayor, Allen Thompson, who had refused to meet leaders of the black community or to respond favorably to their rising demands for fair treatment in employment as well as equal access to restrooms, restaurants, theaters, parks, schools, and libraries for blacks and whites. Kay Mills, a former editorial writer for the Los Angeles Times, has written four books in addition to the current Changing Channels: The Civil Rights Case That Transformed Television, published by the University Press of Mississippi. Her subjects have included the history and influence of women in the newspaper business, women’s history in the United States, Mississippi civil rights leader Fannie Lou Hamer, and the Head Start preschool program for low-income children. She has twice been a juror for the Pulitzer Prize for biography, once as chair of the jury. More information about her books can be found at her web site, www.kaymills.com.